18-Month Manufacturer Warranty and Lifetime technical support. BUILT-IN IR REMOTE CONTROL: Built-in IR signal extension feature allows you to control the playback device remotely. Imagine you have a DVD player in your media room and a TV in your living room, while you are in the living room, you can still use your DVD remote to control the DVD player with IR CONTROL EXTENSION function. UNCOMPROMISED VIDEO QUALITY: Supports vivid, high-definition videos up 1080p @60Hz. 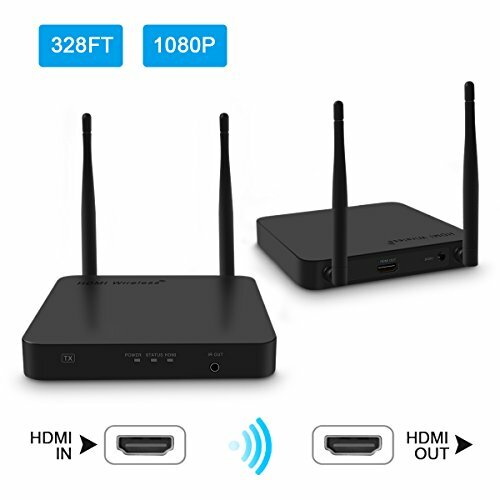 Compatible with HDMI 1.3 and HDCP 1.2 (High-bandwidth Digital Content Protection); best used for TV/video applications rather than computers or real-time applications; Note: A delay of less than 0.5 seconds might occur due to data compression- Not recommended using for PC gaming. EASY TO USE: PLUG&PLAY. No complicated cable or wire installation needed so setup is quck and easy and the wall-mountable metal housing provides multiple placement options for the best signal broadcast or reception angles. NOTE: Do NOT install multiple kits in the same location as this may cause signal interference. 18 Month Warranty: Risk Free18-Month Manufacturer Warranty and Lifetime technical support. If you have any questions or concerns with this product, please do not hesitate to contact us. If you have any questions about this product by FiveHome, contact us by completing and submitting the form below. If you are looking for a specif part number, please include it with your message.